Mr. Gulamhuseinwala was appointed as Trustee for the Open Banking Implementation Entity on 13 April 2017. In his role as Trustee, he has oversight and responsibility for Open Banking’s development and delivery of the common technical standards underpinning the Competition and Markets Authority’s (CMA) open banking initiative. He is seconded to Open Banking from Ernst & Young LLP (EY) where he is a London-based partner in its financial services practice. 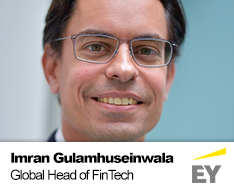 He is also EY’s Global Head of FinTech. He joined EY in 2014. Prior to joining Open Banking, he has been involved with the Entity’s work through its stakeholder working groups and has been active in financial technology as both an investor and a start-up founder. He was awarded an OBE in the New Year’s Honours list for his contribution to the financial services sector.